Modern Detached House in an Established Residential Cul De Sac. Enjoying Pleasant Rural & Sea Views from the Rear Bedrooms. 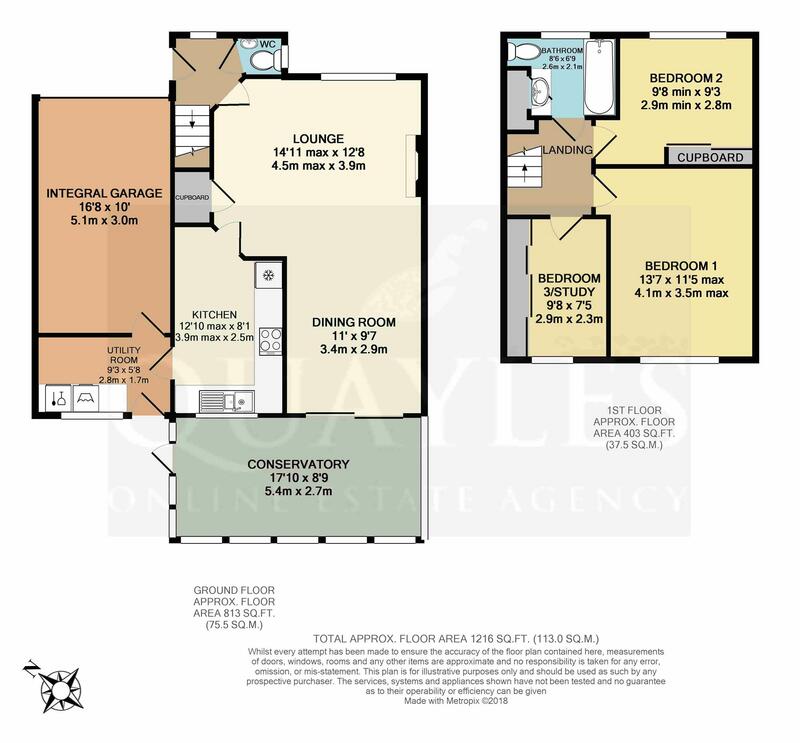 Bright & Spacious Accommodation in Good Order Throughout. Comprising Entrance Area with Cloakroom WC. Spacious 23'9 Open Plan Lounge & Dining Room Plus Conservatory. Modern Breakfast Kitchen with Appliances & Adjacent Utility Room. 3 Double Bedrooms (1 Currently Used as a Study/ Dressing Room. Bathroom with White 3 Piece Suite & Built In Store/ Linen Cupboard. Predominantly uPVC Double Glazed with Gas Fired Central Heating. Generous Integral Single Garage & Off Road Parking for 2 Cars. 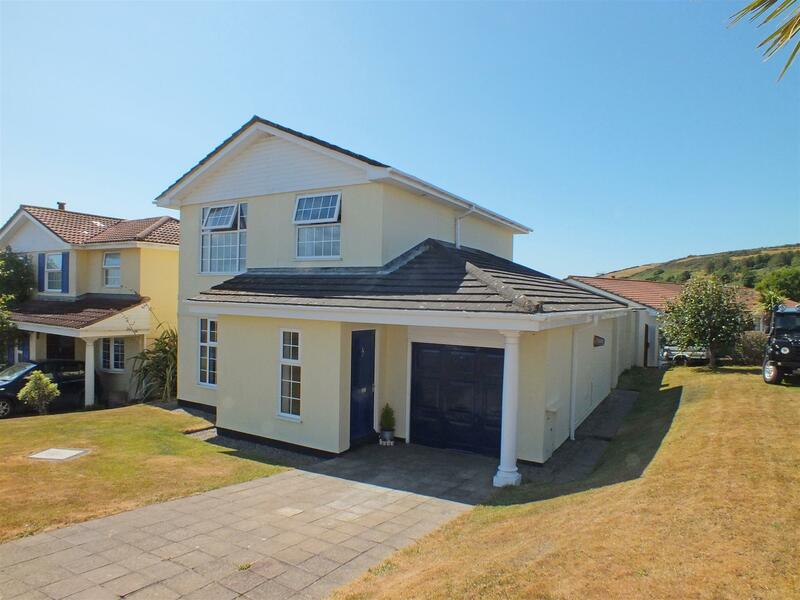 Set on a Good Size Corner Plot with Open Plan Lawns to Front & Side. Private South West Facing Enclosed Rear Garden with Lawn & Patio. Having the Benefit of No Onward Chain. From the Four Roads roundabout travel into Port St Mary and continue along onto Bay View Road with it's shops and restaurants. Follow the road around to the right onto Park Road and bearing right again onto Fistard Road. Continue on up, passing Perwick Rise on the left and taking the next right turn into St Mary's Glebe. Follow the road around, passing the first two cul de sacs and the property will be found on the left hand side, being clearly identified by our For Sale board. Portico entrance with light. Hardwood door to the entrance area. Stairs lead off to the first floor. Front uPVC window. Parquet effect floor covering. Smoke detector. Doors to the lounge and cloakroom WC. Fitted with a modern white suite of wall mounted hand basin and push button flush WC. Obscure glazed uPVC window. Wall mounted mirror. 'Washed wood' effect laminate floor covering. A naturally bright and spacious L shaped room with decorative coving and two chandelier style lights together with matching wall lights. Featuring an 'Adam' style fireplace with a modern inset electric fire. Large uPVC window to the front. Understairs cupboard. TV and satellite points. Clear opening to the dining area. Having ample space for a dining suite including a sideboard. Sliding double glazed doors lead into the conservatory. Of modern double glazed construction with a matching glass roof. Two opening top lights and a door to the rear garden. Tiled floor. Power Points. Fitted with a range of light wood effect wall and drawer line base units together with contrasting laminated work surfaces incorporating a 1 1/4 bowl stainless steel sink with a lever mixer tap. Integrated fridge and freezer. Inset four burner gas hob with a 'whirlpool' stainless steel filter hood above and a 'Cooke & Lewis' electric fan oven beneath. Feature glass splash back and mosaic background tiling. Space for a breakfast table and chairs. Close boarded ceiling with inset directional spotlights. Timber framed window. Slate tile effect floor covering. A glazed multi pane door leads into the utility room. Fitted base unit and laminated work surface with a washer/dryer and dishwasher installed beneath. Corner shelving. Double glazed uPVC window and door to the rear garden. Door to the garage. Slate tile effect, laminate floor covering. Access to a small loft. A wider than average single garage with a pitched roof and partial high level storage space. Up and over door to the front. 'Valliant' gas fired combi boiler. Consumer unit. Light and power points. Fitted shelving and useful wall hooks. Loft access. Modern light fitting. Power points. A small double size room which is currently utilised as a single size study/ dressing room, having a wall of wardrobes built in to one side with a combination of shelving and hanging rails together with sliding mirrored doors. A tilt and turn uPVC window enjoys distant sea and headland views across the neighbouring properties. A superb double room which could easily accommodate a 'Super King' or twin beds in addition to freestanding furniture. Enjoying sea and headland views via a uPVC tilt and turn window. Telephone and internet connections. A further double room with a large uPVC window to the front. Built in double wardrobe with a hanging rail and high level shelf together with mirror fronted sliding doors. Coved ceiling. NB measurement excludes the door recess. Fully tiled to complement the modern white suite of panelled bath with a mixer shower over, curtain and illuminated extractor. Tiled plinth with a painted wooden top and an inset oval basin. Niche for toiletries etc. Concealed door to a deep set linen cupboard located over the stairs. Push button flush WC. Obscure glazed uPVC window and 'washed wood' effect, laminate floor covering. Open plan lawn. Driveway for two cars leading to the integral garage. Fascias and soffits have been replaced with low maintenance uPVC. A south west facing, enclosed garden which enjoys much privacy. Easy care raised beds, shaped lawn and a paved patio. Cold water point. Gated access to the open plan side garden which is laid to lawn with a pathway leading to the front. All mains services are installed. Gas fired central heating & double glazing throughout - primarily in uPVC.